Will Ackerman, founder of Windham Hill Records, and producer of many fine recordings at his Imaginary Road Studios, is producing concerts with his recording artists. 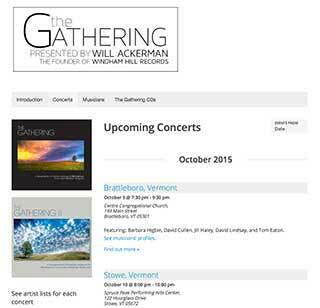 The Gathering Concerts website serves as a calendar for the project, with artist profiles that can be displayed in a directory, or on a page for each concert. Using custom fields and tags, the artist profiles are easy to create and display consistently. The Event Calendar plugin provides an easy interface for entering the other details of each concert in the series.